There have been plenty of cool hatchbacks throughout the past few decades, but there has only ever been one hot hatch – the VW Golf GTI. Back to claim its spot at the top of the segment, the 2018 Volkswagen Golf GTI is cruising all over the world and one of its many stops is Las Vegas, NV. Before everyone rolls out the red carpet, here are some details the 2018 VW Golf GTI. Stronger than ever before, the 2018 Volkswagen Golf GTI is forging a path to Las Vegas, NV with its 2.0-liter TSI® turbocharged and direct-injection engine, constantly ravaging roads with 220 horsepower and 258 pound-feet of torque. All of that brute strength can be reined in with either a standard six-speed manual transmission (6MT) or an available six-speed automatic (6AT). 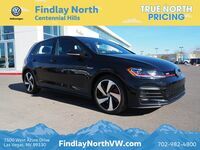 As estimated by the Environmental Protection Agency, the 2018 VW Golf GTI earns 25 mpg in the city and 33 mpg on the highway when tamed by a 6MT. Shoppers who go with the 6AT will fall about a mile behind with 24 mpg in the city and 32 mpg on the highway. The 2018 VW Golf GTI is available in three trim levels—S, SE, and Autobahn—and all of them can be paired with either the 6MT or the 6AT. This allows for six total configurations, which means that there is a 2018 Volkswagen Golf GTI for just about everyone. No matter the configuration, any Golf GTI is an excellent choice and an exhilarating experience. Listed below are key features from each configuration as well as the starting Manufacturer’s Suggested Retail Price (MSRP) for each. S 6MT – Standard features include cruise control, power windows, VW Car-Net App Connect equipped with Apple CarPlay™ and Android Auto™, LED Daylight Running Lights, Bluetooth connectivity, a 6.5-inch touchscreen interface and so much more. Starting MSRP is $26,415. S 6AT – Standard features match the S 6MT. Starting MSRP is $27,515. SE 6MT – Standard features include Blind Spot Monitor with Rear Traffic Alert, a power sunroof, voice control, keyless entry and ignition, VW Car-Net Security & Service, an upgraded 8-inch touchscreen interface and much, much more. Starting MSRP is 30,470. SE 6AT – Added features match the SE 6MT. Starting MSRP is $31,570. Autobahn 6MT – Added features include dual-zone automatic climate control, adaptive cruise control, an auto-dimming rearview mirror, a premium audio system, navigation and more. Starting MSRP is $35,070. Autobahn 6AT – Added features match the Autobahn 6MT. Starting MSRP is $36,170.